Roy had made his first feature film in 22 years and was making a whirlwind tour through parts of the Carolinas to promote it. When my bosses told me Roy would visit Salisbury on Saturday morning, Nov. 15, I was elated. The timing was perfect to really “put on the dog” for him. But what exactly would I do? The obvious answer was to show one of Roy’s old westerns, if I could get one. A call to the man who booked the movies for our three Salisbury theaters brought this response, “There haven’t been any theatrical prints of Roy Rogers’ movies in the Charlotte exchange for 15 years.” So I asked him if he could make some calls and see if he could find one in the other film exchanges. Bookers could be temperamental at times, especially if you caught them at a busy time. I expected, perhaps, that he would just say no, but instead, he said he would call around. Either that afternoon or the next day, Dan the booker called me back and said, “I found you a Roy Rogers western ... in New York City. I can get it for you, but you’ll have to pay $50 to ship it down on a bus.” “Fine, I replied. Get it.” So the first major hurdle was accomplished. Roy’s visit would begin with “My Pal Trigger,” a B-western Roy had made with wife, Dale Evans, and friend, George “Gabby” Hayes, way back in 1946. Next, I thought it would be nice to have a city of Salisbury official be on hand for Roy’s visit. I called then Mayor Bill Stanback and asked him to participate. I had met Bill as a fellow castmate during the Piedmont Players’ production of “Arsenic and Old Lace” a few years earlier. Stanback said he would be there. I regret I can’t recall exactly how the next step came about, except I thought it would be a good idea if we could have some live music before Roy spoke to the audience. It seems as though one of the concession stand young ladies told me that North Rowan High School had a really good pep band. So I called the school and got the band director on the telephone. I apologize to this gentleman for not remembering his name. Friend Carol Carpenter suggested it might have been Charles Dunlap, but I am still not positive. But I told him what was going on, and he was very excited and said the NRHS Pep Band would be there. I asked if, by chance, he had sheet music for Roy’s theme song “Happy Trails.” He said no, but that he would compose an arrangement. Talk about going the extra mile. And so, because of the help of some really gracious people, the plans all fell perfectly into place. The afternoon of Nov. 14, a telephone call from the Trailways bus station on Innes Street informed me that I had some film there from New York. The Saturday morning of Nov. 15 found me at the Terrace around 7. Up first was to change the marquee. Down came “THE PINK PANTHER,” and went “WELCOME ROY ROGERS, KING OF THE COWBOYS.” The staff arrived around 8:30 and prepared the concession stand for what I hoped would be an avalanche of people. The NRHS Pep Band pulled in a little later. I asked them to set up down front to the left side of the screen. The microphone where folks would speak was on the right side. At 9, we opened the doors to the patrons who had formed in the parking lot. Very quickly, the 600 seats of the auditorium were filled. The pep band played a selection of songs for the crowd. People then started to fill the aisles and line up across the back row of the auditorium. Then they spilled out into the lobby, and it became very crowded. Fortunately, none of the 800 people now in the building (by the Salisbury Post estimate) was the Salisbury fire marshal, or there might have been a problem. “My Pal Trigger” hit the screen around 9:30. Mayor Stanback had also arrived. Inside the auditorium, folks were watching the 1946 version of Roy Rogers. Right on time at 9:30, the 1975 Roy Rogers rode up to the Terrace Theatre, not on a horse, but in a white convertible. The difference between the two Roys was slight. The nearly 30 years had been very kind to him. We rushed him through the side door up the stairs to my office, where for the next 30 or so minutes, he spoke with Sylvia Wiseman of the Salisbury Post and Mike Mangan of local radio. We all had a great time listening to this mild-mannered gentleman. Roy’s long-time manager, W. Arthur Rush, popped his head into the office and said, “Roy, they’re playing one of your old pictures. Come take a look.” I led the King into the projection booth, and he watched a few minutes and said, “That’s ‘My Pal Trigger,’ made that one a long time ago.” Then Mr. Rush told me we needed to get Roy down front. The NRHS pep band hit “Happy Trails,” and Roy jogged down the long aisle and took the microphone from me. Instead of starting to talk, he turned to the band director and said, “Play it again,” then sang the entire song for the crowd. An unexpected thrill. I asked for the microphone and introduced Mayor Stanback, who welcomed our guest to Salisbury and then presented Roy the key to the city. Another surprise. 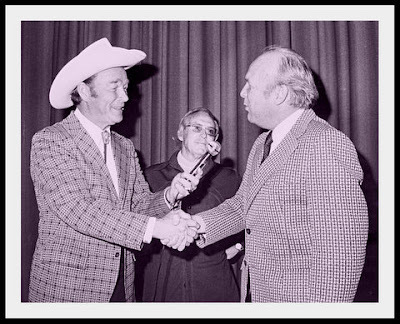 Roy Rogers is welcomed to Salisbury by Mayor Bill Stanback. Then Roy spoke for a bit about his career and the new movie he had made, “Mackintosh and T.J.,” which would open at the Terrace the following week. A Q&A session went on for about 20 minutes. Folks asked Roy all sorts of questions: How was Dale? What was she doing at that time? Did he really have Trigger stuffed? Why aren’t movies like they used to be? And soon it was time for Roy to move on to the next town. He left the building by going through the lobby, speaking to the folks who hadn’t been able to get into the auditorium. People gave him gifts. Some women kissed him on the cheek. As he got into the white convertible, he said to me, “Thank you for a wonderful morning.” I was probably speechless, a rare occurrence. Too bad they headed south, not west. The movie wrapped up inside, the crowd dispersed, and I went back up the ladder to the marquee. Down came WELCOME ROY ROGERS, KING OF THE COWBOYS and back up went “THE PINK PANTHER.” We had a 1 p.m. matinee. No time to reflect. But I have many times since. The following Monday morning, I received a call from our advertising director telling me more people turned out to see Roy at the Terrace in Salisbury than at the Tryon Mall Theatre in Charlotte. I later received nice letters from our company president and my district manager, but the letter that touched me the most came from Roy’s manager, Rush. He stated that the Salisbury appearance drew the largest turnout of any city Roy visited, and that no other town had put on the show Salisbury had. Roy had been very impressed. This coming Nov. 5 will mark the 100th birthday of Leonard Franklin (Roy Rogers) Slye. The “King of the Cowboys” passed away in July 1998 at the age of 86. Dale Evans followed in February 2001. To many people, they have become part of western Americana just like Wyatt Earp and Annie Oakley. And for one brief Saturday morning, 801 of us Salisburians rode the happy trails.